Clear-Lay, comparable to Mylar, is a clear, archival film designed for overlays, stencils, and protective coverings. Acid-free, it contains no plasticizers and offers flatness, clarity, and dimensional stability. Sheets are .005" (.127 mm) thick. Assorted Color Pack — This pack of assorted transparent colors includes 25, 9" × 12", 0.005" thick sheets, five each of Red, Clear, Blue, Green, and Yellow. ® Grafix is a registered trademark.™ Clear-Lay is a trademark. ® Mylar is a registered trademark. Not all plastic films are created equally. 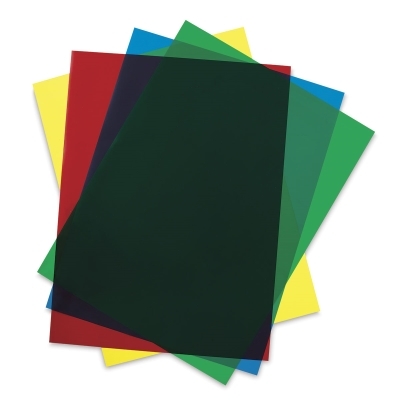 See just some of the many creative uses there are for Grafix plastic films. We'll explain the difference and help you pick the right film for your fine art work or craft project.